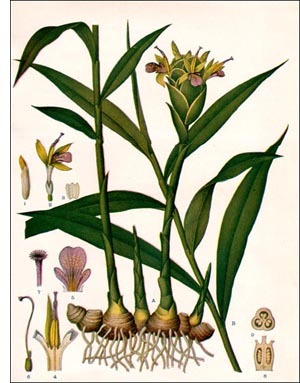 The well-known spice, Ginger, is the underground stem (rhizome) of an herbaceous, reed-like plant known as Zingiber officinale. The rhizome is perennial, but the leaf and flower-bearing stems are annual. The stems are from three to six feet high. The leaves of the upper part of the stem are sword-shaped; the lower leaves are rudimentary and sheath-like. The flowers occur in the form of conical spikes borne upon the apex of stems which bear only sheath-like leaves. The ginger plant is said to be a native of southern Asia, although it is now rarely found growing wild. It is very extensively cultivated in the tropical countries of both hemispheres, particularly in southern China, India, Africa, and Jamaica. The word ginger is said to have been derived from the Greek "Zingiber," which again was derived from the Arabian " Zindschabil," which means the " root from India." It is further stated that the word was derived from Gingi, a country west of Pondecheri, where the plant is said to grow wild. True ginger must not be confounded with "wild ginger," which is a small herbaceous plant of the United States. The long, slender rhizomes of "wild ginger" have a pungent, aromatic taste similar to ginger. At the present time Jamaica supplies the United States with nearly all of the ginger, and this island is, therefore, known as " the land of ginger." Cochin-China and Africa also yield much ginger.